In an exclusive excerpt from his new book, Colin Powell's former adviser explains why neither of them resigned despite reservations about the Iraq invasion. People often ask me why I didn’t resign over Iraq. They also ask why Powell didn’t. One situation when resignation is warranted is if a person fundamentally disagrees with a major issue. Although Iraq constituted a major issue, and although I disagreed with U.S. policy, my disagreement was not fundamental. I was 60/40 against going to war. No organization could function if people left every time they lost out on a 60/40 decision. Had I known then what I know now, that Iraq no longer possessed weapons of mass destruction, then it would have become a 90/10 decision against the war, and in that circumstance I would have left had the president gone ahead all the same. If I had resigned, it would have been a one-day story and would not have affected the course of history. Had Powell resigned, it would have been a major story, but my sense is that Bush would have pushed ahead. As for Colin Powell, it would have taken a great deal for him to resign in protest over a single policy decision, given his military background. Powell possessed a powerful sense of loyalty and duty and patriotism, all of which meant that he was willing to put up with a lot. It was no accident that Powell chose to keep a portrait of George Marshall, another general who became secretary of State, prominently displayed in his office. Powell would cite the anecdote in which Marshall, returning to the department after having lost an intense argument with Truman over the decision to recognize the state of Israel, was asked by aides if he was going to resign. “No, gentlemen. You don’t take a post of this sort and then resign when the man who has the constitutional responsibility to make decisions makes one you don’t like.” Powell also possessed great confidence in his own considerable skills, which in turn gave him the belief that if he remained on the inside he would be able to help ensure that policy came out better than it would have had he left. Whether a decision to go to war against Iraq absent a belief that Iraq possessed weapons of mass destruction would have met that criterion for him is unclear. But again, that was not the context in which any of us was operating. If I had resigned, it would have been a one-day story and would not have affected the course of history. Had Powell resigned, it would have been a major story, but my sense is that Bush would have pushed ahead. The one exception to the above might have been if either Powell or Tony Blair dissented publicly at the 11th hour on grounds that there was no WMD or that Saddam had complied fully with Security Council resolutions, rendering war unnecessary. If either Powell or Blair had taken the initiative to dissent from the policy and called on Bush to alter course, the president would have been hard-pressed not to give the inspectors more time. Of course, neither man was so disposed given what both thought were the facts about WMD and Iraq’s noncompliance. But I cannot think of anyone else (excepting Saddam) who was in the position to have altered Bush’s trajectory. From WAR OF NECESSITY, WAR OF CHOICE by Richard N. Haass. Copyright (c) 2009 by Richard N. Haass. 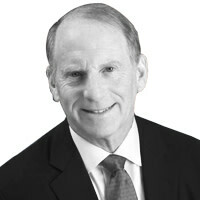 Reprinted by permission of Simon and Schuster, Inc.
Richard N. Haass is president of the Council on Foreign Relations. Haas was director of policy planning for the Department of State, where he was a principal adviser to Secretary of State Colin Powell from 2001 to 2003, as well as special assistant to President George H.W. Bush and senior director on the staff of the National Security Council from 1989 to 1993.